Emergencies can render us financially helpless. That’s why it is so important to have money set aside. If you’re not much of a saver, now is the time to begin building up an account of at least six months’ worth of take-home pay. At some point, you will probably need it. What would you do if you didn’t have those funds set aside? In an emergency situation, finances are the last thing you’ll want to think about. The gift-giving season is over for another year and now the bills are beginning to arrive. Start paying down your debt with your refund. Cars aren’t a luxury like in the early 1900s when only the very rich could afford one until Ford developed the assembly line making them affordable to the middle class. Most people need and have a vehicle today. Try to reduce this debt now. If your car has seen better days, begin a car fund now so you’ll be prepared. There are many reasons for updating your home. You may need to expand for a new baby, your mother-in-law, or an office, you’re downsizing, and you need the value of your home to improve, or make it more marketable to sell. Consider those cost-prohibitive areas that have been tough to tackle like the roof, siding, heat or hot water furnace. The more money you put toward your house payment, the sooner it will be paid off and you’ll save on interest, too! Whether you’re 21 and just starting out or 60 and still hard at work, funding an individual retirement account makes your refund work for you, such as an IRA that will get you a step closer to a comfortable retirement…Start finding out how much you need to retire. Life insurance is often a taboo subject, but if you have children that count on you, this should become a top priority. It can pay off a mortgage, help with college costs, and help keep your loved ones safe. Life insurance premiums are less than most people expect, and $35 a month is not unusual for a 20-year, $500,000 policy. Charitable contributions set a great example for your whole family. What better way to make use of extra money, then to empower others who are not as fortunate. 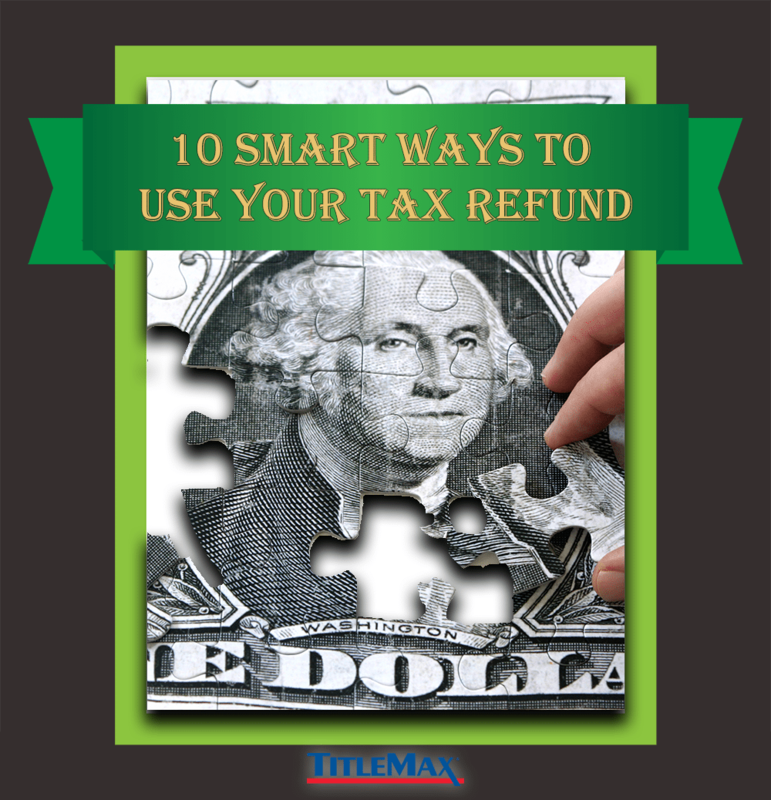 It may also be tax deductible the next time you file, which may help to improve your refund next year. This is a nice way to ease the strain on your kids and reduces family debt. The cost of a college education continues to rise with the average annual tuition being between 9k – 33k per year. Using your tax refund to start a college fund or add to an existing fund each year will help you reach your goal amount quicker. If your refund doesn’t cover your expenses as planned, and an emergency fund isn’t available, get the cash you need today at TitleMax. Get started online now and find out how much you can get in minutes. Or stop by a TitleMax store near your nationwide for same day cash, and quick approval.